Donate by Mail or Fax using the CBBEP donation form to the left. Many companies have corporate gift matching programs and will match charitable donations made by their employees. 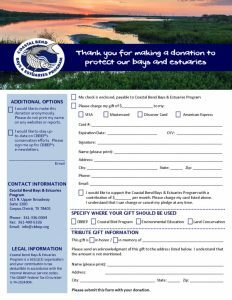 Through corporate gift matching, you can double the impact of your gift to the Coastal Bend Bays & Estuaries Program. AmazonSmile is a simple and automatic way for you to support the Coastal Bend Bays & Estuaries Program every time you shop, at no cost to you. When you shop at smile.amazon.com, you’ll find the exact same low prices, vast selection and convenient shopping experience as Amazon.com. Link your Amazon Smile Account to CBBEP and Amazon will donate a percentage of your purchase price directly to us.